WHEW. So this past weekend was GEN CON which is quite possibly one of the largest (if not largest overall) tabletop gaming convention ever. This year they counted 56,614 unique attendees. 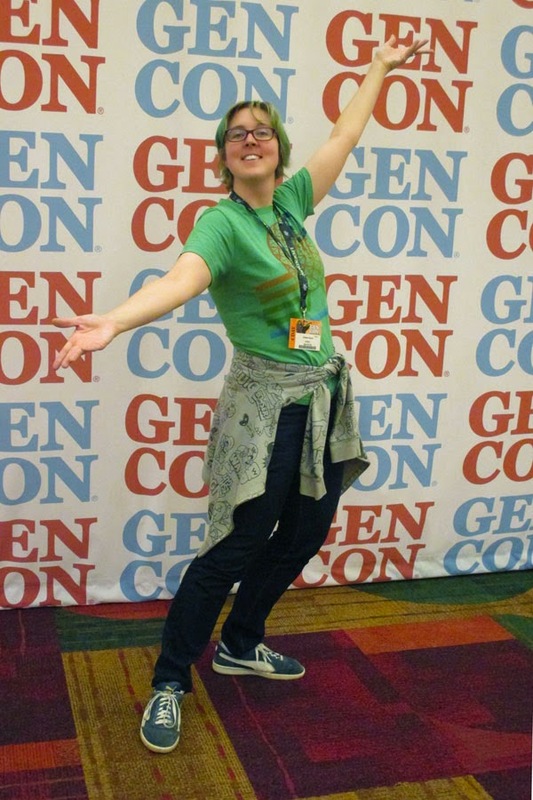 Anyway, seeing as how we got there before like, midnight, I wanted to take our two Gen Con newbies, ThatGameGirl and PhD Cosplay to the location to get our tickets as well as get the lay of the land before 40,000 people filled it. they had this neat photo space! I couldn't help it. Upon arriving we found a HUGE LINE, which was weird because it was like 10 at night, and I'm just going OMG HOW WILL WE GET TICKETS IN THE MORNING. This was about half the line. The line moved INCREDIBLY fast, and we very quickly made our way up to the will call and got our tickets all in the span of like maybe 30 minutes at most. When I get all complainy about sign in processes for other shows, THIS is why. They processed so many people in such a short time (AND a majority of badges have event tickets linked to them and we get them all in one place). 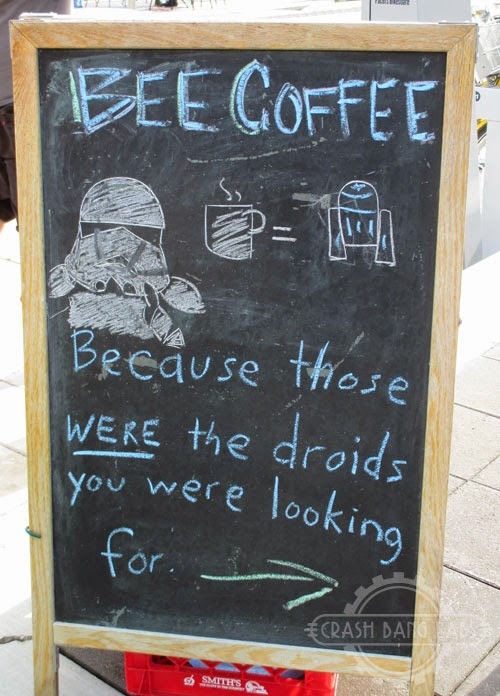 Gen Con's got this down to a science. So we checked in, went to our temporary abode, slept, woke up and headed to the show. We were staying at the Crowne Plaza which is always awesome (yay trains and closeness! ), and we got ready for the entrance ceremony. Which is them rolling giant dice and then opening the doors after a short speech. and this crowd extended ALL the way down to the end of the hall. 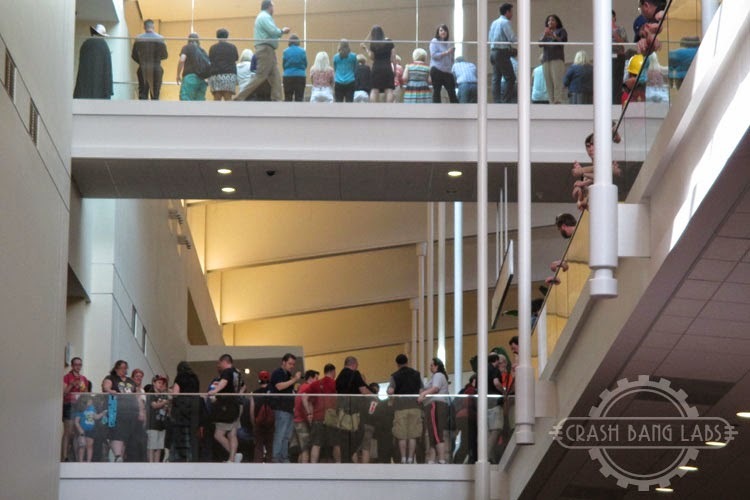 People were also filtering onto the balconies this year. 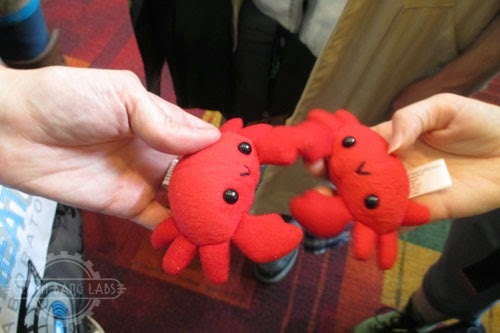 The dealer hall this year was even BIGGER than before, and honestly, it took me at least two days of wandering to figure out how on earth to see it all. I will say it is TOTALLY fun taking new people around and watching their ferretshock at all the awesome things. 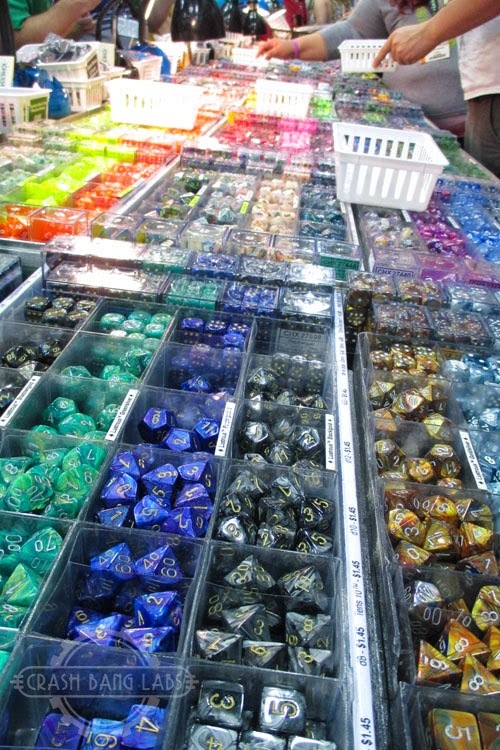 I, of course, had to stop by Chessex, and got myself a whole bunch of new dice. QUICK! DRIVE ME CLOSER SO I CAN HIT THEM WITH MY SWORD!! I loved the cute artwork on the banner, and complimented the staff on their outfits and they were like, "Oh hey, do you want to ride in the tank" and I was like "OH DO I EVER!!" And then they had PROPS. It was the best. 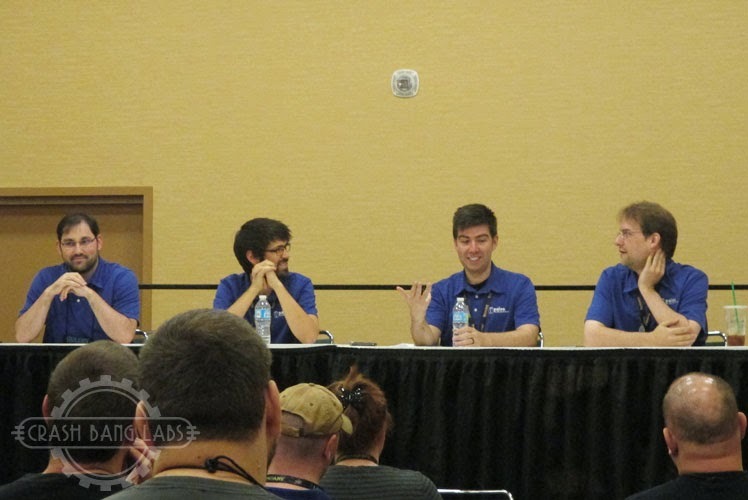 We went to a panel (and a couple others over the weekend) put on by the Paizo staff about their game system, adventure paths, and books coming out. They're always hilarious and I was laughing so hard because they're all such DERPS and I heart them all. And these people are responsible for the game system I love so much. I'm TOTALLY OKAY WITH THIS. After a tiring day, ThatGameGirl (Kristy, not to be confused with me, Kristie), went to hang out at the Munchkin tavern, I took pics of PhD (Sil), and then crashed out in the room. OH and had FOOD TRUCK FOOD which is the greatest food to ever grace the walkways of any conventions. Seriously. Their food is ALWAYS amazing, and such good quality. Friday was "Red-Haired Superheroines" day with Sil and myself, and we realized quickly in that we had chosen poorly as we were all in so many panels that we hardly met. Except around lunch, so we got a couple of pics. 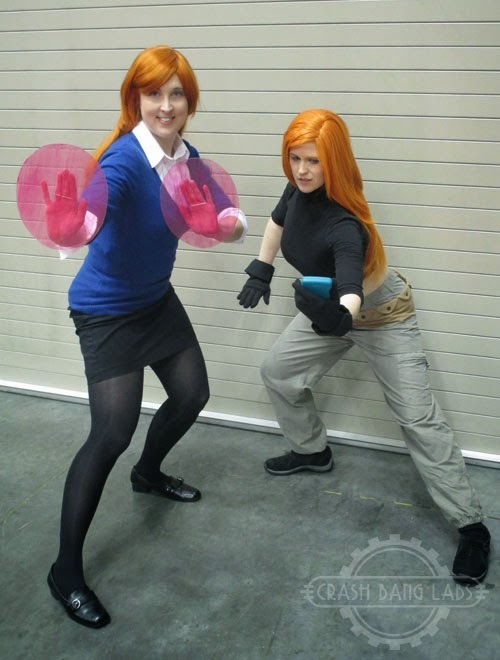 I was Gwen Tennison from Ben10 and Sil was Kim Possible from ...Kim Possible! One of my cheapest costumes ever! We also did some demos of games that day. 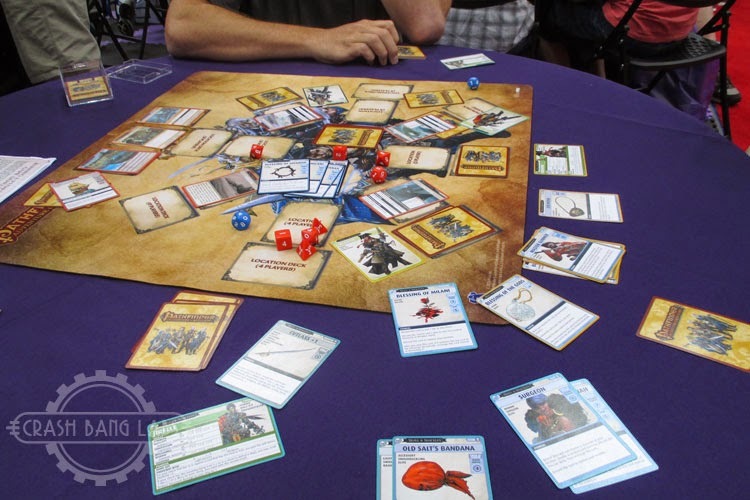 As always Dave and I test out the Pathfinder card game which is surprisingly entertaining! We're definitely contemplating getting the Wrath of the Righteous campaign in card form, as both Runelords and Skull & Shackles were very entertaining. And yes, they had a card that was Lonely Island and we all sang "I'm On a Boat". I buckled many swashes that day. 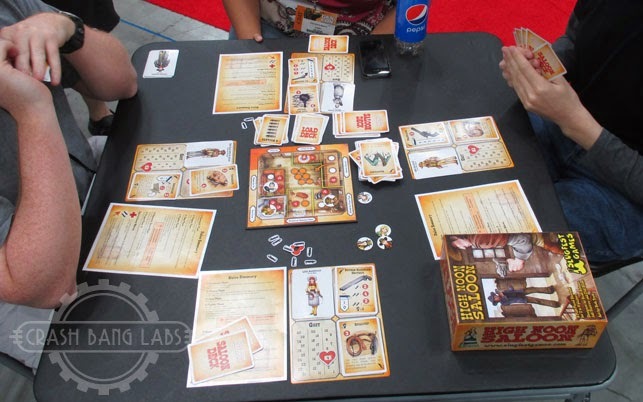 I also brought my pals by the Red Dragon Inn booth to have they play High Noon Saloon where you are having a brawl in a wild west saloon. It was quite hilarious, as always. I made sure to throw somebody "out th' winda!" Friday had panels, and then last but not least, we had TRUE DUNGEON. I can't remember if I wrote it up the two years ago when I tried to play it, and it was so horrible and disappointing I wanted to quit forever. Well, Kristy wanted to try it for once, and I wasn't about to let her go into a big run full of people she doesn't know so a few of us got together and had an almost full run ourselves. And I have to say it was the best move I made. This year's puzzle run was so delightful and fun, and I felt kinda smart when we could actually GET the solutions. It also probably helped we were on Non-Lethal mode because really, we didn't care about EXP or levels. This year's theme was were were fetching an airship, and we had to power it up and fought a couple of sky baddies in the end. We battled glados in the first room hooking up the engine cells (which we finished in like RECORD TIME omg) and only one of the puzzles we didn't solve but were two steps away so I didn't feel too bad on it. We died at the end, but that happens, and I got to help pilot the ship! Definitely interested in trying it again next year if they keep this theme up. Saturday... Saturday was a blur. I woke up, dressed up, and went to a crafty panel where I made a cute tree pendant. The weather was kind of crap, and I was getting stressed, so I only wore my outfit briefly. 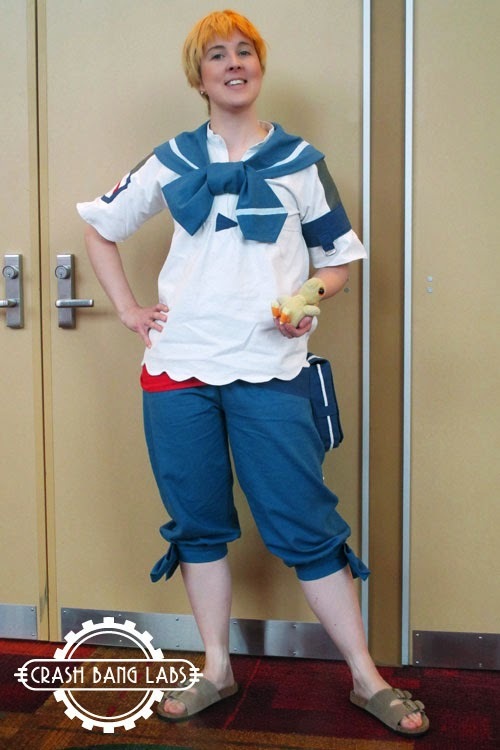 We called this one "Summer Fun Gauf"
I ended up going back to the room, changing into regular wear, and roved the hall. Which was a bad idea. Tensions mentally had been high for me, as I take my travel planning very seriously and if it feels like anybody has had any inkling of a terrible time I feel like it's my fault and I've ruined everything. THEN couple that with the fifty bazillion people there, hawkers, and things, and I just could not take it. I had to hide, and it was kind of a terrible day for me. I apologize to anybody who had tried to say hi that day as I was just NOT in the talking mood. After a good dinner and rest in the room, pals came by and we taught some new people MAO which was great and hilarious! Sunday was "pack everything up" day and rove the hall. I went to my favorite Paizo panel: "Secrets of Golarion" which I laughed so much, this was the only pic I grabbed of the staff on the panel. Just keep being awesome. I know you won't tell us what happened to Aeroden. That day was also Family Day, where they offer all sorts of deals/bonuses to families who want to attend. 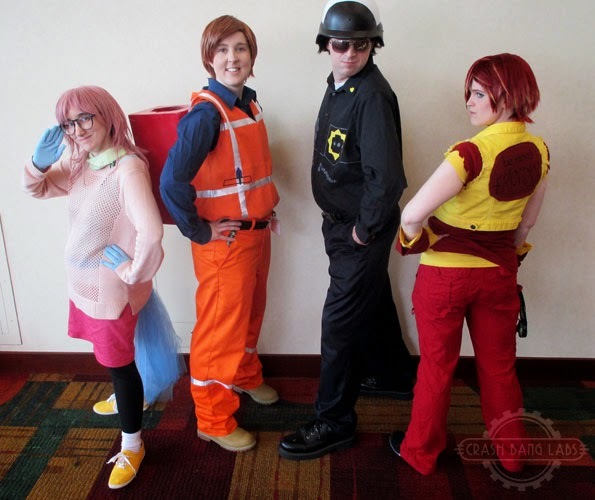 So what better day to go as LEGO Movie characters than that?! I had a fun time waving and saying hi to all the kids who were like OMG THAT'S MY FAVORITE MOVIE and then we geek out together and sang Everything Is Awesome. We had an Angry!Unikitty in our midst this time! We sat near one of the doors and watched the convention close down, which was relaxing, if not a little eerie. Everything suddenly got really quiet as vendors started moving out. We said our goodbyes, and went to reside at our friend's house again. Monday we ended up just hanging out chatting about conventions and things (I'll have announcements on that later), and then drove home. Dave got ConPlague, and I'm trying to not get it before we go to a concert on Sunday in Chicago. Ooh, I can comment now! 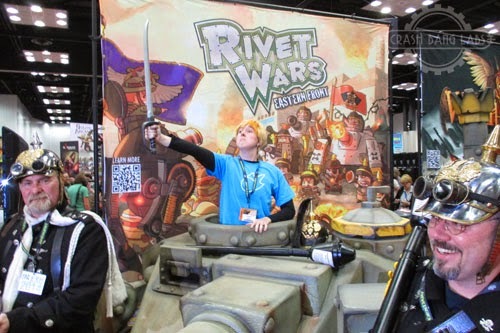 Gen Con is a blast, and I'm just a wee bit sad it took me several years to discover it. It was great to have you! 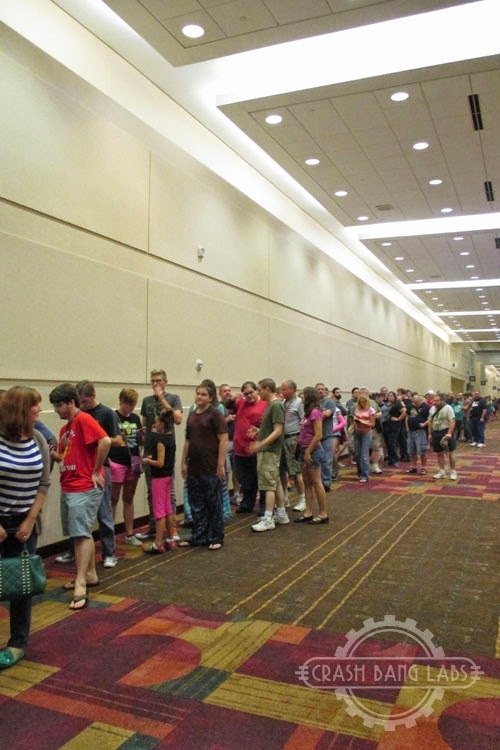 And YES, Gen Con has line management and turnover to not just a science, but an art form. 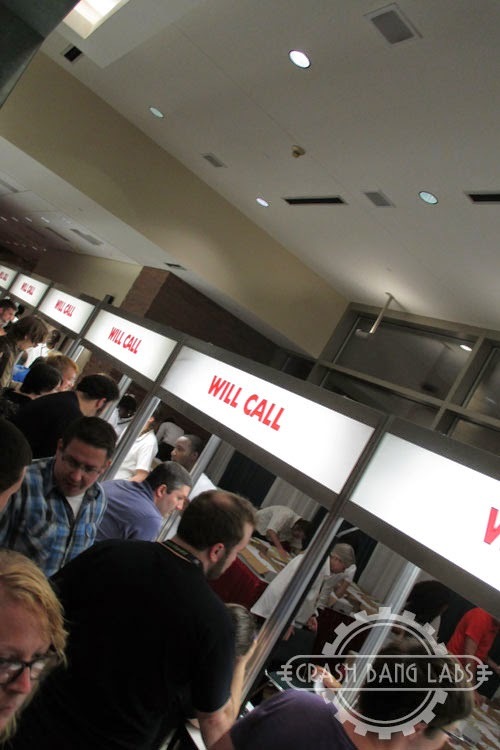 On Wednesday I got into the Will Call line and it stretched nearly the full length of the convention center (which is about a city block), literally thousands of people long. I was through in about half an hour or so. Amazing. 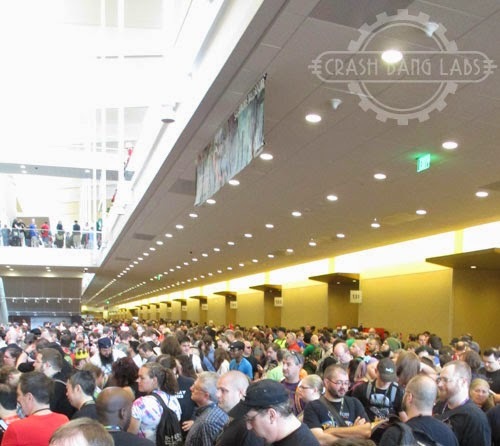 People sometimes complain that Gen Con costs more than other cons, but they really do run a professional event.